KDI proudly manufactures custom countertops and custom vanity tops in our Wyandotte warehouse. We have a wide selection of colors and designs made from high quality, durable materials like granite, quartz, acrylic, and laminate. 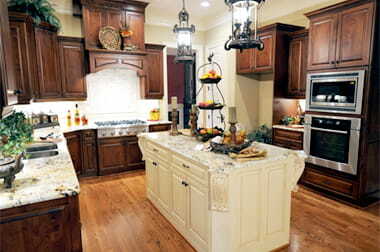 KDI provides countertop fabrication and countertop installation for all styles of kitchens and bathrooms. Contact us for a comprehensive quote today. Get in touch with our professional design staff today for your dream kitchen or bath tomorrow. Custom manufactured countertops are something you use everyday. At KDI kitchen countertop showrooms we can show you all varieties of countertop materials that can match any budget or design. From quarried slab stone countertops like granite and quartz to formica varieties – we can help you get the right countertop for your kitchen design project. Whether you are working on a residential or commercial project, you can rest assured that you will receive outstanding service and quality from KDI.